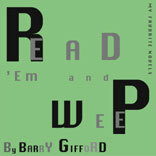 Read ‘Em and Weep is an engaging collection of Gifford’s anecdotes, reviews and responses to his favorite novels. At turns deeply moving, humorous, insightful and poignant, they are each prompting literary takes, intimate and accessible. They further reading by taking reading further, back into authentic literary form. The styles shift with the subjects, but all spring forward with his characteristic intelligence, charm, and edge: wise, funny, poetic. This book is a pleasure, a conversation, and an introduction to a fascinating and particular selection of great writing. Available at DIESEL, A Bookstore, in Oakland and Malibu, and other select independent stores.